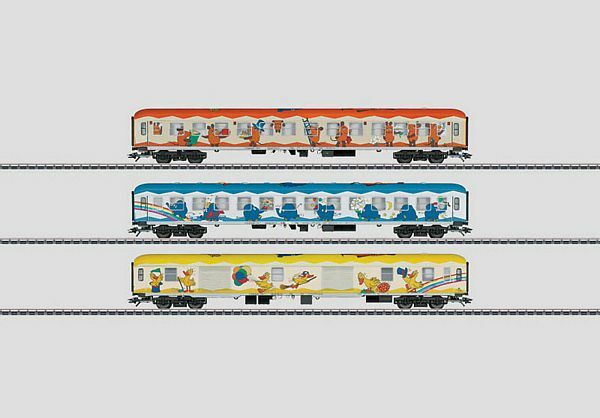 This is 43869 the Mouse Show Train Passenger Car Set from Marklin. Prototype: 3 different design German Railroad, Inc. (DB AG) express train passenger cars, with different advertising themes. 1 type WGmh 824 entertainment car, with the main design theme of "Maus" / "Mouse". 1 type Bm 235 compartment car, 2nd class, with the main design theme of "Elefant" / "Elephant". 1 type Dms 905.1 baggage car, with the main design theme of "Ente" / "Duck". The cars look as they did in the early part of 1996. The cars have underbodies specific to the different car types. The trucks are Minden-Deutz heavy designs, with disk brakes like the prototype, with and without magnetic rail brakes depending on the car type, and with and without side stabilizers and separately applied generators depending on the car type. All of the cars are ready for installation of the 7319 current-conducting couplings or the 72020/72021 current-conducting close couplers, the 73400/73401 lighting kits (2 per car), the 73406 pickup shoe, and the 73407 marker light kit. Total length over the buffers 84.8 cm / 33-3/8". DC wheel set per car 4 x 700580. The right motive power to go with this car set is the class 110.3 electric locomotive, which you can find under item no. 37012. This model can be found in a DC version in the Trix H0 assortment under item no. 23486.